What do you need? Food? Water? 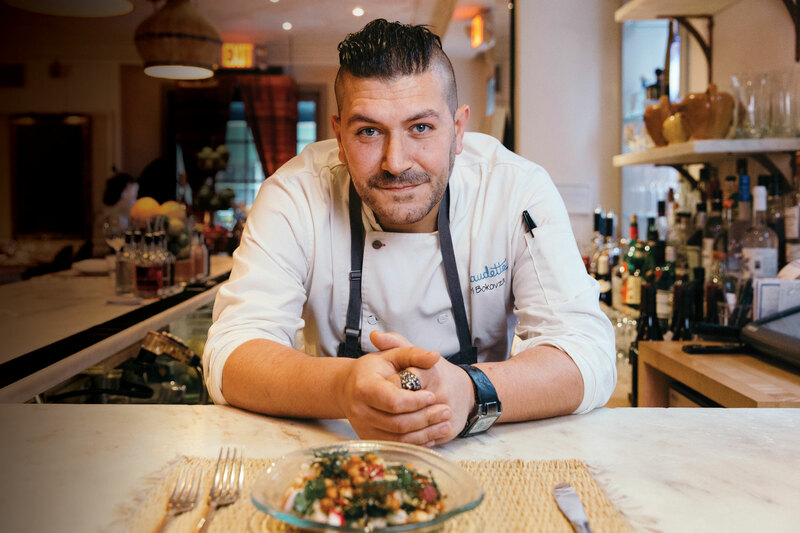 Five shots of tequila?” This is what Ari Bokovza, the chef of the Greenwich Village restaurant Claudette, will ask you when you sit down with him. And when you joke that you’ve already done the tequila shots and assure him that you don’t need anything, he’ll come back with a pile of fragrant, pliable flatbread and creamy hummus anyway. You’ll devour it, of course, any idea of restrained professionalism out the window. After all, it’s easy to slip into feeling comfortable at Claudette, a restaurant best described as cozy, with warm, dim lighting, rattan chairs, and lots of cushy upholstery. Bokovza, in contrast, has that rough-around-the-edges, gruff, masculine Chef-with-a-capital-C look of Bourdain lore. A self-described “bad kid,” Bokovza didn’t go to culinary school. Instead, when he was 18, he started working in some of the best kitchens in New York. First at Union Square Cafe, where he learned hospitality from the masters. Next a brief stint in Barcelona where he learned to make whole suckling pig and “really intense sauces.” Then, at the now-departed Picholine, where he learned high-volume fine dining working the meat and fish stations for pre-show crowds. Then: opening the Lever House and the Modern as the chef de cuisine (where the restaurant earned a three-star review from The New York Times during his tenure) and the Standard Grill. Then: the Harrison. 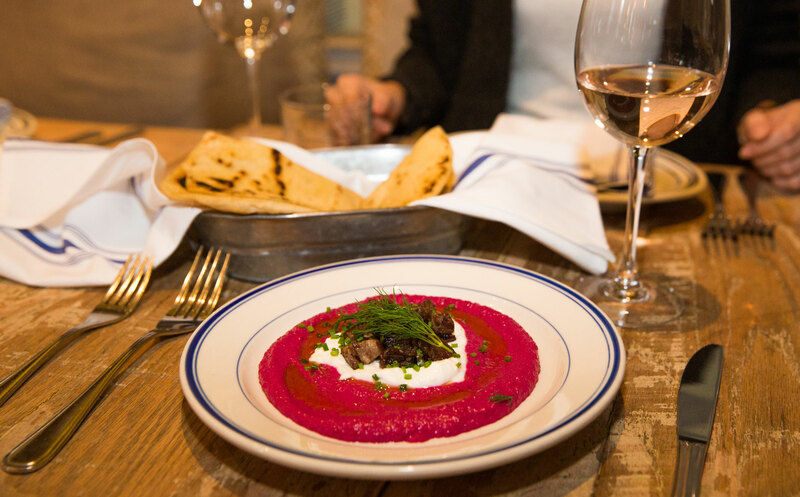 It’s here at Claudette — a Provençal restaurant that highlights the strong tradition of North African flavors and influence in southern France — that Bokovza can really cook the way his Tunisian grandmother taught him. “She can throw down like nobody’s business. She was always making couscous and different pickles and harissa and spices when I was growing up,” he says. But Bokovza wants to stress that Claudette isn’t serving fusion, or “the South of France meets North Africa for the hell of it.” Rather, the cuisines have been integrated for years. Large numbers of North African immigrants moved to the South of France — and they brought their spices and their cuisine with them. All over Provence, markets carry spices and flavors of Northern Africa. And as you take your umpteenth bite of fresh flatbread, you’ll think he’s been pretty successful in his performance. Inspired by his stepmother accidentally eating a bite of her beet salad with a bite of crispy beef tongue, the dish is as follows: a hummus made out of beets instead of chickpeas, with tahini, cumin, garlic, and lemon; a horseradish-infused yogurt; and beef tongue that gets brined for a few days, slowly poached all day so it’s perfectly tender, then flash-fried for crispiness. 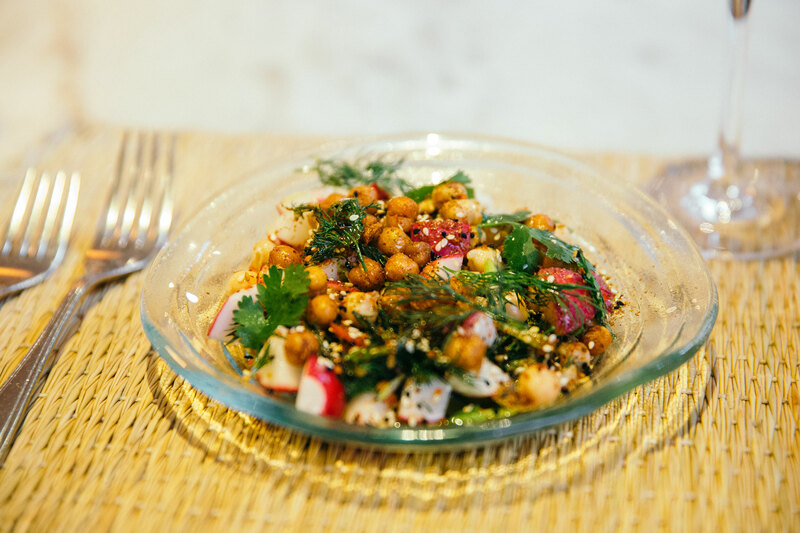 “My grandmother used to make salads that had tons of mint and dill, so this is our take on the Israeli salad or the North African salad that is completely spiked with fresh herbs.” It’s rounded out with nuttiness from sesame seeds and onion seeds, and a savory greenness in the form of za’atar. When Bokovza came to Claudette a year ago, he insisted that a whole fish be added to the menu. It’s an integral part of “real Mediterranean cooking” he says. 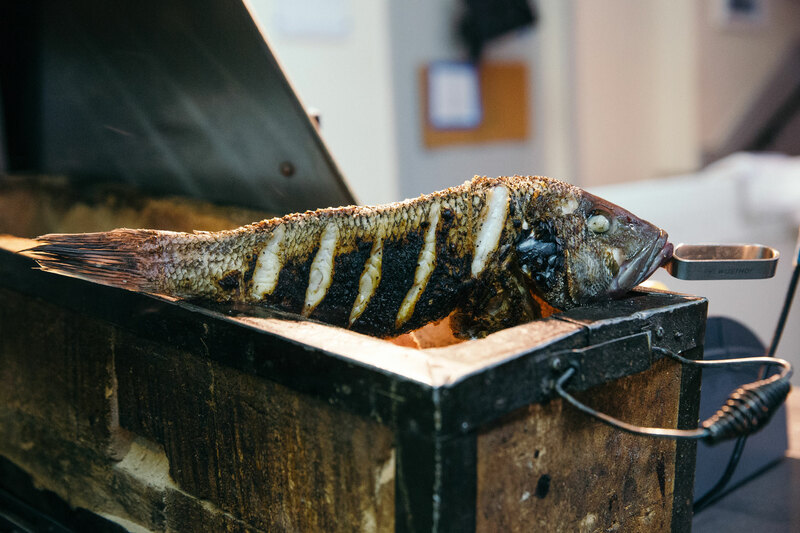 The whole fish, Bokovza explains, is skewered and stuck right on top of the charcoal in a Japanese Yakitori grill ∇ you’ll find it charred and crisped to perfection. It’s served with a riff on the classic French grenobloise sauce. Instead of the simple brown butter, lemon, and capers, Bokovza uses preserved lemon and olives. That sauce does double duty flavoring the fish and the potato latkes that get served alongside it as a nod to Bokovza’s Jewish heritage. Pick up a complimentary copy of “The X Magazine” with your next order of concierge-delivered tickets in New York City, or buy an issue at CultureLivesHere.com.